The American Legation Museum is housed in the American Embassy, established in Tangier soon after Morocco became the first power to recognise the United States of America as an independent country in 1777; the Moroccan ruler, Sid Suleiman, gifted the US this building in 1821. Although the sultan presented such buildings to a number of countries, the US is the only one to have held onto the property until the present day. The museum houses art collections, restored historic rooms, and a number of permanent exhibitions. 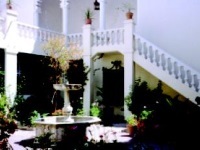 The American Legation Museum is one of the most popular attractions in Tangier and well worth a visit, particularly as entrance is free, but it should not demand too much time - an hour or two is sufficient for most visitors. For many American tourists it is fascinating to explore the first official representation of their country overseas. Guided tours are offered and the curator/tour guide is a font of knowledge, but it is possible to explore on your own.